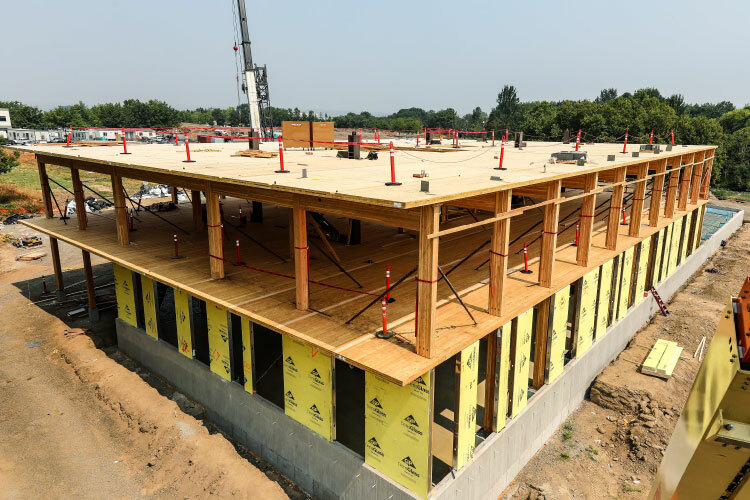 Washington, D.C. — The International Code Council’s (ICC) Committee Action Hearings in Columbus, Ohio, have concluded with a clear endorsement of building codes that will enable the use of mass timber technologies in buildings ranging up to 18 stories. Though taller mass timber buildings are currently being built under various local codes, this move by the ICC ensures that model code provisions will be available to many more building officials. Mass timber structures are generally built with large panels made of cross-laminated timber (CLT), nail-laminated timber (NLT), glued-laminated timber (Glulam) or structural composite lumber (SCL). The greater availability of CLT has provided new options for builders. All buildings under the International Building Code (IBC) must meet specified fire performance standards, whether built of steel, concrete or mass timber. The 14 code provisions passed out of the ICC Committee Action Hearing established new fire resistance standards and procedures for mass timber that are more rigorous than comparable steel and concrete structures. “Each new type of construction, Type IV-A, Type IV-B and Type IV-C, has hourly fire protection requirements more robust than those required for comparable noncombustible buildings,” according to an independent analysis of the ICC proposals. “Fire testing has also demonstrated that the charring properties of mass timber provides a reliable and predictable measure of fire resistance, even without added noncombustible protection,” the study concluded. The ICC deliberations were conducted by a board-appointed Ad Hoc Committee on Tall Wood Buildings, consisting of building officials, fire services professionals, engineers, materials providers and other industry stakeholders. “The Ad Hoc Committee on Tall Wood Buildings has worked for two years to evaluate the code, investigate the science of mass timber, and develop consensus proposals to ensure that tall mass timber buildings meet the highest standards,” said Susan Jones, an architect and member of the ICC committee. The committee was aided by new fire resistance testing on full-scale mass timber structures conducted by the U.S. government’s Bureau of Alcohol, Tobacco and Firearms (ATF) Fire Research laboratory, the world’s largest fire research lab. The testing confirmed that the fire resistance of mass timber structures exceeded current code requirements, even without sprinkler systems. However, the code proposals also require passive and active fire protection systems, including noncombustible protection for all exterior walls, concealed spaces and exit enclosures, as well as sprinkler systems with redundant water sources. The formal adoption of the codes into the IBC is pending votes at the 2018 ICC Public Comment Hearing in October, in Richmond, Va., and a nationwide online vote by code officials in November.